UPDATE: After initial excitement about xUnit, I needed to deal with some specifics. And now I don’t advise to move ALL your tests to xUnit. I’d recommend go into that slow and read through my rant here, before you commit to converting. Nunit is a great testing framework. Only it is a little old now and new testing approaches are no longer fit into Nunit concepts. I’m talking about using Autofixture for generating test data. So I decided to see how xUnit will pan out for our projects and should we convert all our tests into xUnit or not. Nunit, but this does not work nicely with Resharper 8.1 and NCrunch. Also I decided to move away from Moq mocking framework and give a go to NSubstitute. I love Moq framework – it is simple, flexible enough and easy to learn. But if you churn out tests at any rate per hour, you are sick of typing Mock<IServiceName>() every time. And if you use Autofixture, then you have to type fixture.Create<Mock<IService>>() – a bit of mouthful. Amount of times I’ve forgotten to put Mock<> as part of generic type is infinite. This simply gets annoying. NSubstitute allows you to create mocks without specifically saying Mock<>. And this shortens your tests and reduces scope for error. I’ve made an experiment and compared exactly the same test in NUnit/Moq vs. xUnit/NSubstitute. Nunit test was 17 lines of code with setup, xUnit with Data Theory was 8. See this gist for old style. And check out the shortness of new approach. The tests are from production and both test exactly the same thing. Only second one takes almost half the size and time to write. In this blog-post I’ll talk through of adding xUnit to a project. I’m writing this as I’m converting one of my projects from NUnit/Moq to xUnit/NSubstitute. These 2 will install for you xUnit, xUnit.Extensions, NSubstitute as dependencies. Then you’ll need to update NSubstitute to a latest, because as a dependency it does not give you a latest version. // ignore all Virtual properties on complex objects. So old tests still use fixture = new Fixture().Customize(new DomainMoqCustomization()). Where new ones will involve xUnit and NSubstitute. This basically removes all of the Arrange stage. Making the test half the size. Please be careful with reference of Theory attribute. Both NUnit and xUnit have this attribute, so many times you need to specifically mention xUnit.Theory for things to work. System.IO.FileLoadException: Could not load file or assembly 'NSubstitute, Version=1.4.3.0, Culture=neutral, PublicKeyToken=92dd2e9066daa5ca' or one of its dependencies. 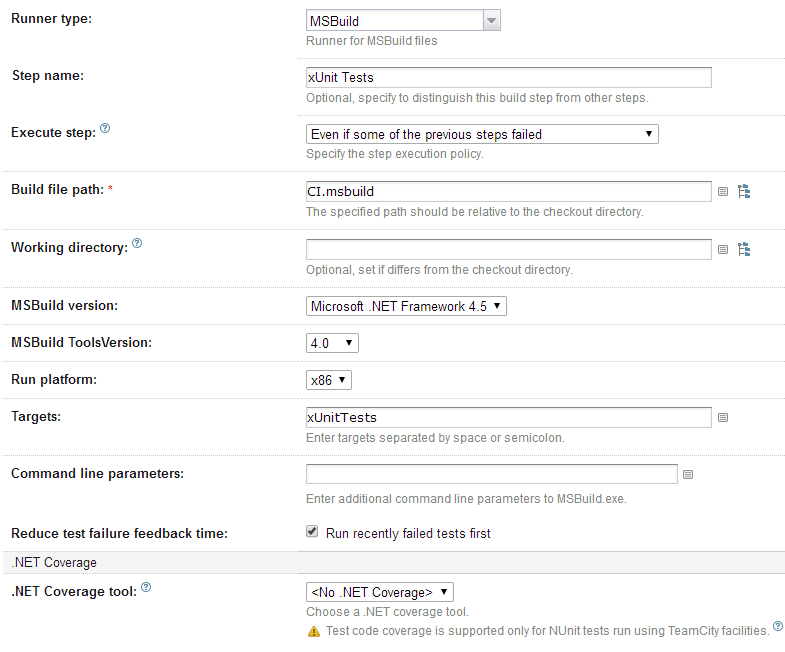 I’m using NCrunch for running my tests in Visual Studio. NCrunch has no problems with xUnit – supports out of the box. Next step is to get xUnit tests to be executed on your Build Server. We are using TeamCity, so I’ll talk about it just now. My other project is built on hosted TFS service http://tfs.visualstudio.com/ and make xUnit run on that beast will be a topic of my next blog post. xUnit has inbuilt support for TeamCity – you don’t have to do anything special, only create .msbuild file to execute your tests and xUnit will check the environment and will output the result in format that TeamCity can understand. I like to have assemblies used for build process separately and have .build folder in solution. So I copied these files to .build/xunit. You might want to use the files from packages folder, but I don’t trust Nuget on this part. You’ll need to point Assembly property from xunit element to your assembly(s) with tests. And that should do it. Now check in, don’t forget to check-in xunit assemblies in .build folder and changes to your build script. If everything went fine, you should see your xUnit tests running in TeamCity.